Christensen Arms’ MPR is a great lightweight long-range rifle, thanks in part to its carbon-fiber components. Innovating, experimenting and accurizing have been Utah-based Christensen Arms’ focus for decades. 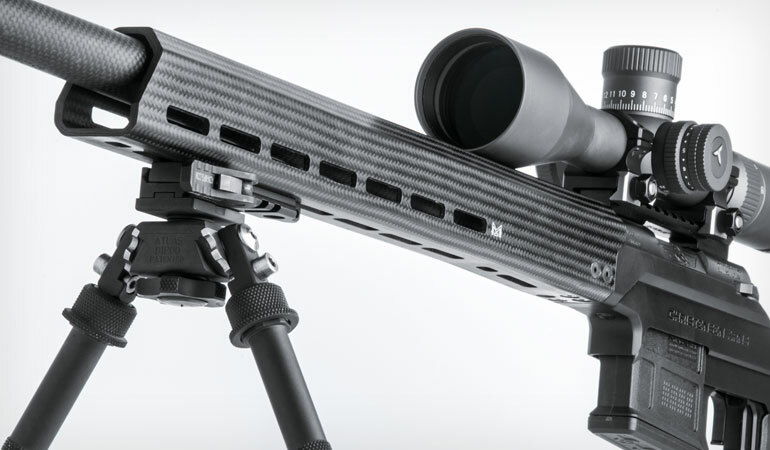 Its new Modern Precision Rifle is touted as a next-generation chassis system, riding the tidal-wave trend of configurable, chassis-stocked rifles for precision shooting games. Rather than designing a ponderously heavy rifle ideal for competition but entirely unsuitable for field work, Christensen held true to its roots and engineered a precision rifle in a practical weight: 6.9 to 8.4 pounds, depending on caliber and barrel length. 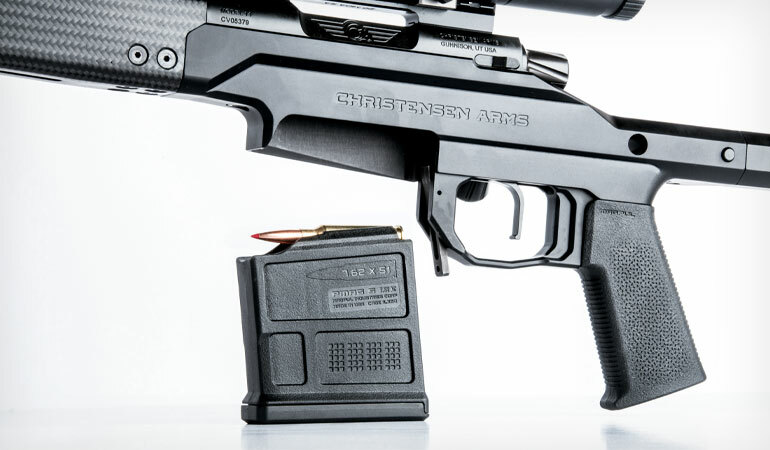 To achieve that light-for-type weight, Christensen utilized a carbon-fiber-wrapped 416R stainless steel target-profile barrel, which is significantly more expensive to produce than a like-profile all-steel tube, and each button-rifled barrel is hand-lapped to boot. In addition to the carbon-fiber-wrapped barrel, the fore-end is also carbon fiber, which trims weight significantly. But even with that, it’s priced competitively—only $2,295 for the short-action version. When you compare the price tag on this semicustom rifle against production guns like Ruger’s Precision and Tikka’s T3x TAC A1, which cost between $1,500 to $2,000, it’s remarkably inexpensive. The MPR is available in various barrel lengths from 16 inches to 27 inches, and it’s chambered in 6.5 Creedmoor, 6.5 PRC, .308 Win., .300 Win. Mag., .300 Norma and .338 Lapua. Not all barrel lengths are available in all cartridges. Each barrel is threaded with a 5/8x24 pitch and fitted with a removable, tunable stainless side-baffle brake. The brake sports four Allen-head screws in the upper radius, which can be removed to direct a certain amount of jump-taming propellant gases upward. The skeletonized aluminum buttstock is adjustable for length of pull and cheekpiece height. The grip is standard AR fare, so you can swap it out for any AR grip you like. The barrel is installed in Christensen’s dual-lug stainless steel action. Engineered with a Remington-type footprint and to accept Remington 700 scope bases, Christensen’s actions are machined from billet 416 stainless and feature an enlarged port for trouble-free ejection and an improved bolt release. The bolt release is sort of Sako-esque and is located at the left rear of the action. Each bolt is spiral fluted, as is the bolt shroud. Additionally, the bolt handle is skeletonized to further reduce weight. An M16-type extractor is employed, and bolts for magnum cartridges are fit with dual ejectors to ensure enthusiastic ejection at the precise angle appropriate to clear scopes with large windage turrets. An oversize, fluted bolt knob and nitride treatment finish off the bolt. To optimize performance in today’s precision rifle games, the MPR action is compatible with AICS-type detachable magazines and employs a “tactical” magazine release. The rifle comes with a 20 m.o.a. rail-type scope base and boasts an adjustable match-grade semi-straight trigger. The sample on mine broke at a beautifully crisp one pound, 14 ounces with less than an ounce of variation over a series of five measurements, according to my Lyman digital trigger gauge. That’s outstanding. Once installed into the action, barrels are reamed to match-chamber tolerances and bolted into the chassis. Machined of 7075 billet aluminum and finished with a black hard-coat anodizing, the MPR chassis has a V-block bedding channel, making for simple, trouble-free mating of action and stock. 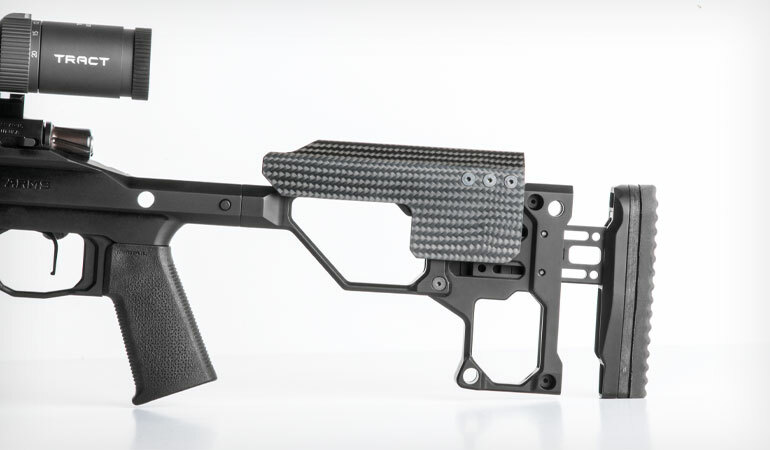 The folding stock is aircraft-grade aluminum and features an adjustable-height cheekpiece made of carbon fiber and mounted to a machined aluminum insert. While not tool-less (adjusting it requires a small Allen wrench), it’s simple and positive. Since the cheekrest must be lowered to clean the rifle, it’s discreetly marked with a scale to enable the shooter to return it to the proper position. Length of pull is also adjustable from 12.5 to 14.5 inches by loosening a couple of screws with an Allen wrench. A nice, squishy LimbSaver recoil pad tames recoil, and the length-of-pull insert also sports a scale for adjustment reference. The folding stock rotates quietly and effortlessly, and it folds comfortably past a closed bolt. It’s secured in the closed position by powerful magnets. A short, flat section at the toe of the aluminum skeleton stock is drilled and tapped for a section of 1913 rail for mounting a monopod, and multiple flush-fit QD cups on each side provide several places to attach a carrying strap. Folding the stock is accomplished by pressing a low-profile release button at the left rear of the chassis, just forward of the hinge. The stock rotates smoothly and quietly into position along the right side of the rifle and is secured by a pair of powerful magnets set into the stock and chassis. Two additional QD cups are located on the chassis, one on each side just forward of the stock hinge. The AICS-compatible magazine well is cut much higher on the left side than on the right, enabling shooters to slap a fresh magazine in from the left side of the mag well, index against the deeper right side and shove the magazine home. It permits fast, fluid and positive reloads. A generously sized trigger guard enables use with heavy gloves. The grip is standard AR-15 fare, so if you don’t like the grip that comes with a rifle, you can install any AR grip you want. 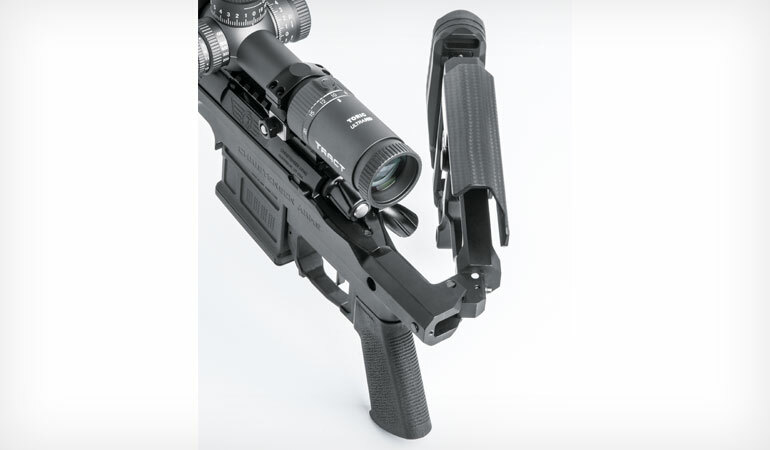 Most competing chassis rifles either have the fore-end machined integral to the action-housing portion of the chassis or interface with various free-float aluminum AR-15 handguards, but the Christensen MPR sports a carbon-fiber fore-end. It features a square bottom, enabling it to ride sandbags nicely. It has slender parallel sides and so feels good in the hands as well and a three-sided top. The MPR ships with either a 14- or a 17-inch fore-end, depending on barrel length, and M-Lok slots provide easy accessory attachment points at three, six and nine o’clock. A four-inch section of 1913 rail is factory installed at six o’clock on the fore-end tip, and it has six cross-slots and a mounting point for a classic sling swivel. Upon picking up the MPR from Gunnies Sporting Goods in Orem, Utah, I was immediately enamored with the rifle. Frankly, I hadn’t expected to be because I’ve become jaded by the deluge of configurable, tactical precision rifles currently pouring into the marketplace. It’s nice to see something so innovative and well made that one can’t help liking it. Because of the 6.5 Creedmoor’s phenomenal popularity, the sample rifle was first available in that cartridge. We’ve pounded the pages here in RifleShooter with coverage of it, but the editor didn’t want readers to wait until another caliber became available. And it cannot be denied that the 6.5 Creedmoor makes a superb test cartridge, offering best-in-class inherent accuracy, bona fide long-range capability and polite recoil. The gun takes AICS-type mags, and the unique mag well design makes reloads a snap. The trigger is superb. Von Benedikt’s sample broke at just under two pounds. I mounted a Tract 4-20x50mm Toric Ultra HD scope in medium-height Nightforce X-Treme Duty Ultralite 30mm rings, which put the magnification ring and the objective bell, respectively, within less than a millimeter of the 20 m.o.a. rail and the handguard. That’s perfect as far as I’m concerned because I dislike having optics mounted high above the receiver on scaffold-like rings. Because the MPR is geared to precision work and is ideal for certain types of long-range competition—such as cross-country matches where time plays a critical role—I gathered up a stack of match-appropriate ammo. But because the MPR falls inside somewhat reasonable hunting poundage—10 pounds, six ounces with scope and empty magazine—I also picked out a couple of my favorite 6.5 Creedmoor hunting loads. 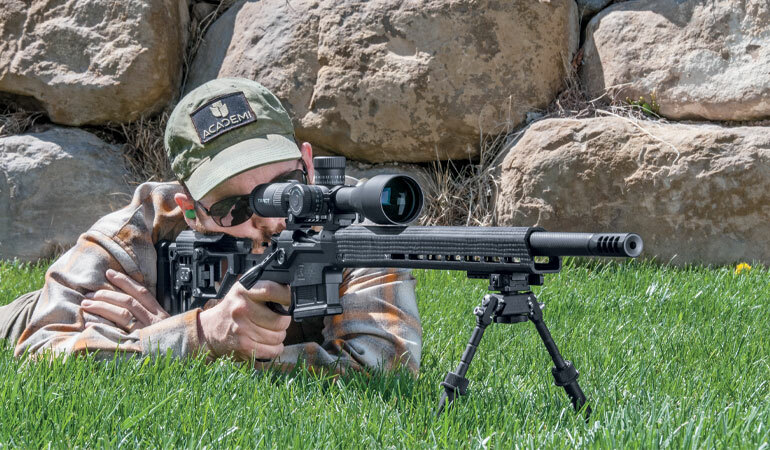 Attaching an Atlas bipod, I bench-rested the rifle for an accuracy test at 100 yards. It’s intended as a precision rifle, so I applied a rather challenging test protocol, firing three consecutive five-shot groups with each type of ammo without allowing the barrel to cool between groups except when I switched ammo types. 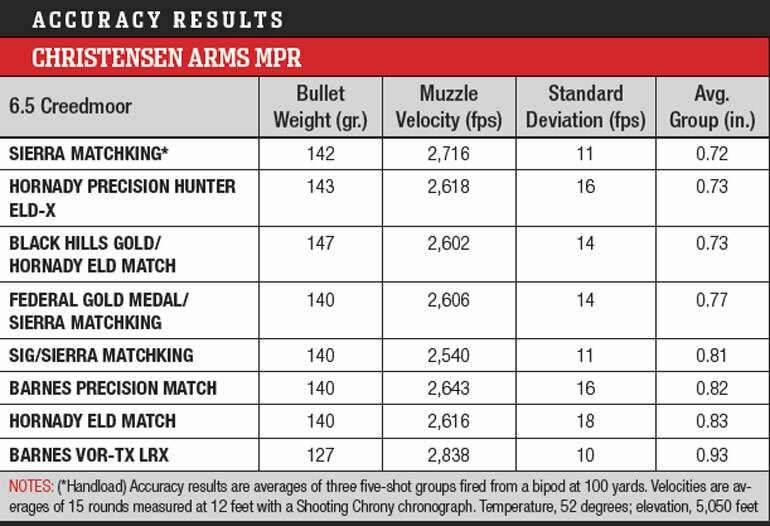 It’s an aggressive test that really challenges a rifle and enables the shooter to determine several crucial characteristics of their particular gun, particularly whether group size opens up and whether point of impact shifts as the barrel heats. Incredibly, not one of the eight loads tested averaged more than one m.o.a. Three averaged less than 0.75 m.o.a. Even better, my tests showed no discernible point of impact shift or group size increase as the barrel heated. Recoil was mild in the extreme, thanks to both the cartridge and the weight. The straight trigger broke crisper than the proverbial icicle. My only beef with the way the MPR fired was with the grip. There’s no place to comfortably lay the shooting-hand thumb along the outside of the chassis, a grip technique in vogue with the sportier of the PRS crowd. Of all the individual test groups fired, only three measured more than one m.o.a.—and that by the slightest of margins. This MPR is an accurate rifle indeed. I also tested a handload I’d worked up for a different match rifle, and it turned in the lowest average. I have no doubt that carefully tuning a load would result in consistent half-m.o.a. accuracy. That’s outstanding for a lightweight precision rifle. Reliability is important, both for competition and for hunting. I ran the MPR fast, working the bolt as if against an unforgiving clock, and slow, as if quietly chambering a round while hunting, and every speed in-between. Reliability was flawless, and function was as smooth as butter. Each MPR ships with one five-round AICS-type Magpul polymer magazine, but 10-rounders are available for less than $20 for those using the rifle in competition or just desiring to have more ammo on tap. While Christensen’s MPR is too light to be perfect for PRS matches, it will serve commendably. Likewise, although it’s a bit heavy to pack into alpine regions in search of mountain goats, it will perform yeoman’s duty for most hunting tasks. And for a $2,295 rifle, it’s impressively accurate. There may not be a better all-purpose semicustom rifle available on the current market.